A new face to the Roof of Africa event, Graham Jarvis etched his name into the mountains of Lesotho when he won the legendary Roof of Africa event held this past weekend in Lesotho aboard his Husaberg TE 300. The “Mother of hard enduro” is said to be the hardest enduro race in the world and that’s what the 44th running of this event was all about: a lot of blood and sweat, man and machine fighting their way through the mountain passes of Lesotho of which some have never been ridden before, taking the world’s best enduro riders to their limits and beyond. 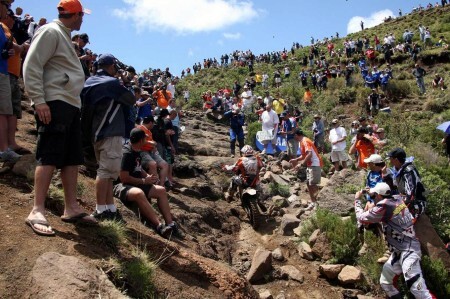 The 2011 Roof of Africa kicked off on Thursday morning with the traditional “Round the Houses”, a 3 lap race in the city centre of Maseru that competitors had to complete on the tar. The race was divided into different classes according to category entered and starting position. The pro riders were sent off first, exciting the crowd that came out to watch the thrilling race. It was no surprise when multiple South African Supermoto champion Brian Capper took an early lead in the Round the Houses race, crossing the finish line in first position, closely followed by previous years’ winner Darryl Curtis with Graham Jarvis taking no risks on tarmac and finishing mid-pack. From “Round the Houses” competitiors made their way to the start of the Time Trial, a 100km racing section that determined the starting order for the next day. It was young South African Marc Torlage that set the fastest time, followed by Jade Gutzeit and Kenneth Gilbert. Roof rookie Graham Jarvis set the fourth fastest time , only 1 minute 42 seconds behind Torlage. Friday’s route foresaw a techincal 200km course and it was previous year’s winner Chris Birch that took the lead, finishing Friday’s route in 6 hours 18 minutes, closely followed by the talented Graham Jarvis. Gutzeit had fallen back to third place, followed by Torlage. Saturday had to determine the race and a sunny day awaited riders and supporters alike. Birch, Jarvis and Gutzeit went into the last race day with a lead of approx. 25 minutes, some navigation mistakes however saw the rest of the field catching up and the race was exciting until the end. The pressure was on and Jarvis had pulled a gap between him and Birch when they approached the 20 minute de control on the top of Bushman’s pass at 2263m above sea level, the last stop where competitors had to recharge their batteries before the last 50km section that was about to separate the men from the boys. It was Graham Jarvis that crossed the chequered flag in first place after a total riding time of 15 hours 24 minutes. He managed to pull a gap of an impressive 22 minutes on previous year’s winner and second placed Chris Birch. “I really enjoyed racing in Lesotho, the Roof of Africa was a great event. A different format of extreme enduro which I can now tick off my list. I will probably have to come back next year to defend my title.” said Jarvis. This debut victory at the Roof of Africa puts the icing on the cake in what was nothing less than a perfect first season for Graham Jarvis aboard Husaberg machinery. He has not only dominated and won all but one of the well known Extreme Enduro races in the world (Tough One, Hell’s Gate, Red Bull Romaniacs, Roof of Africa) but also took victory at the newly established Red Bull Sea to Sky race as well as other Extreme races around the globe like Xticntion in Canada, Ukupacha in Ecuador and Wildwood Rock in Australia.